Very easy to use, GraphiMap for Excel applies the format (including conditional formats) of the cells to vector drawn objects: colors, gradients and filling patterns; thicknesses and colors of the borders. GraphiMap also applies texts with fonts, sizes, colors and alignments. Finally, GraphiMap shows the data with vector shapes that can use the format and text of the cells and be accompanied by a legend. 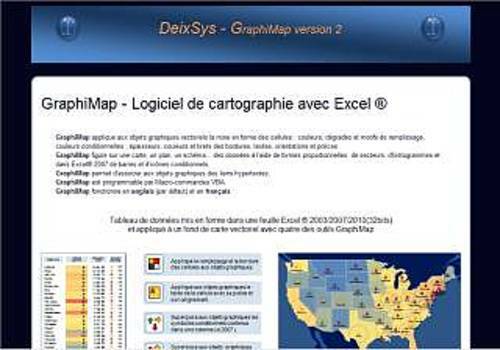 GraphiMap 2.1 works in English and French and is usable in VBA macros. The PDF of the official French Flag, provided by the government. GeoBrevet offers tests and learning sheets for high school students in the 3rd grade who wish to revise their high school diploma in a simple and effective way. The subject of the Geography History Bac 2016 in Pondicherry is available for download. Students in the L and ES series can now discover how to download this document, which is available free of charge.